Don’t have $400 to shell out for a Fein Multimaster? Don’t even have $100 for Dremel’s Multi-Max? How ’bout $40 for Harbor Freight’s Chicago Electric knock-off? I can’t imagine the build quality falls anywhere in the range of the Fein and Dremel, but hey — if you’ve got $40 you can find out. It delivers 19,000 oscillations per minute (compared to as much as 21,000 for the Fein and Dremel). But that’s where the similarities end. While the Fein kit includes a ton of sanding, sawing, and other accessories and the Dremel ships in a variety of kits, the HF model ships with a couple of saws, one cutter, and two sanding sheets. But here’s the real downer: While the Fein and Dremel offer variable-speed settings, you get just an on-off switch with the HF special. And we’re betting that’s a real deal-killer on this tool, which is designed for fine, delicate work. What do you think? Is the Fein really $300 better than the Dremel? Is the Dremel $60 better than the HF? Let us know in comments. I would give the HF a try for this tool since I would be a casual user, I looked at it in the store and it felt like one of their better built electric tools. I had not jumped on one yet because I just haven’t had the need recently. Personally I feel like Dremel in general is overpriced. The tool itself may be reasonable but every accessory/polisher/cutting wheel is WAY overpriced. $20 for 10 re-inforced mini cutting wheels? I’ll blow though those in maybe 2-3 uses! This is the base model. There is also a variable speed model for about $20 more. HF prices are highly variable with the constant sales and ever-available 20% off coupons. I recently bought a Dremel Multi-max for a bathroom remodel. 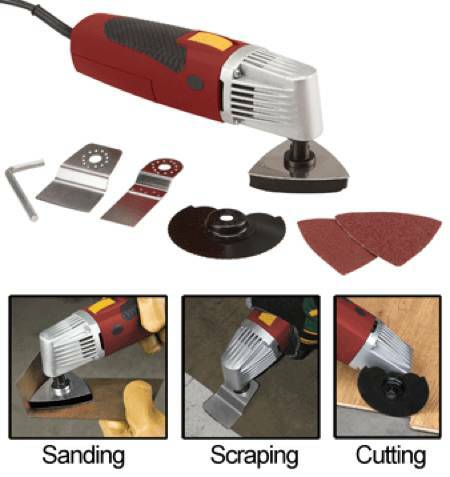 I used it extensively – hard scraper, flexible scraper, cutting metal and wood, sanding and grout removal. I love this thing. I did pretty much every job they do in the commercials – trimmed up a door for marble flooring, tore out some marble tiles that got out of level, cut some copper pipe to size, cut out drywall for a new switch, scraped out calking from the shower and sink and sanded down some fill from patches in the crown moulding (totally hosed the cut). The variable speed is a definite must for several applications, but especially the scrapers. I started off too fast with some caulking and it burned the wood and melted the paint & caulk. I set it at about half speed and it tore through it with ease. Later, I put on the grout grinder, but didn’t change the speed back and it bogged down. I cranked it up to full speed and the grout was turned into such a fine dust that I considered adding some portland and water and re-using it. I looked at the Fein and the Dremel. Since I’m just a Harry-Home-Owner type, the Dremel was enough. If I were a pro, I’d spend the extra on the Fein. There is no way I’d buy the HF – no variable speed sort of makes the tool useless or very limited in application. The most recent issue of This Old House that came had a review of all of the different flavors of this tool from the different manufacturers. Seems like the only real differences were soft start and oscillations per minute. Dremel was on the lower end of price, and seemed to be the sweet spot of function/price. The contractor that did the testing said he has a fein, and couldn’t do without it. For the rest of us part-timers, I think the Dremel would be fine. I could definitely see picking up the HF model just to see if the general tool category actually fits a need. My contractor had the HF version. I always had wondered what that particular tool was used for; he basically said it was a faster chisel replacement. Still wasn’t quite convinced until I started putting in laminate flooring. If you’re not familiar, all the door molding and door frames need to be cut at the bottom so that the flooring can slip underneath to reduce gaps and look slightly more real. I did two frames with a chisel. They probably took 5 mins each. I did one with a grinder and a metal cutting abrasive blade; it made tons of smoke and was clearly going to be too large for most of the work. I went out and bought the HF tool, and did the next 12 cuts in the time it took to do the first two. In my book, that tool’s paid for itself. I have the HF tool and it works great. I used it to cut baseboards where I’m installing built-in cabinets. Also to cut square holes in the middle of a piece of 3/4 ply. I haven’t tried scraping so perhaps I’ll miss the variable speed if I need to scrape but it’s not an issue so far. The unit is heavy and seems well built. There are not a many attachments as there seem to be with the other manufacturers, and the way you attach the blade is just a nut that can wiggle loose. If I used it all the time, I’d probably rather have the Dremel but as it is, I’d rather have the $60. I have the Tool Shop version of this tool. While it doesn’t look identical. it’s pretty close and it look like it uses the same attachments. I got it as a Christmas present, I actually asked for one because I was interested in seeing if I would use it, and did want to spend a ton of money. I played with it for about an hour after I got it and have used it twice since then. My impressions of the tool are that it’s built solidly, the motor is balanced (unlike some knock off dremels I’ve used), and it has enough power so that it doesn’t bog down cutting into harder woods. The sand paper that came with mine was useless. I used to for 10 seconds and there was a bare spot where it had made contact. I recently bought the Dremel model, used it only once so far, and have to say it’s worth the price of admission. I’m working on a project involving fitting several sheets of plywood in a cramped space (with no space behind the wood to allow for a recip saw), which previously would have required many iterations of “cut in garage, bring downstairs, test fit, bring back upstairs for another small cut”, and the Dremel allowed me to essentially micro-cut the wood as I eased it into position. I have a grout removal project coming up that this tool will clearly be perfect for. Since this is my hobby, and not my job, I’m happy with the Dremel. If I had to use it everyday I might consider the Fein, but the Dremel seems powerful enough for me, and I get the feeling that the real difference (much like many powered cutting types of tools) is in the blades, and not as much in the machine itself. We have both the older and newer Fein tools. The older version uses a socket screw to hold the blades in place and has a tendency to allow the blade to slip a bit. The newer tool has a “star-shaped” mounting stud and lever-action hold-down. This does work better and faster. Fein makes an adapter “star” that allows us to use the older machine with the newer blades – but it is not 100% equal to the newer hold-down in speed or anti-slip function. We bought our before the tool was off-patent – so it wasn’t an issue of comparing one to another brand. What we use them for a lot is fitting moldings and undercutting. They have all but replaced our old Crain Jamb saws – which now sit someplace on a shelf in the shop. We have found over the years that the blades (E-Cut particularly) are quite expensive – but that may result form a combination of things like the European quality and costs, Fein’s pricing philosophy and the Euro to $ exchange rate. We usually build the cost into the cost of the job. If I was relying on this tool for my livelihood, I would invest in a Fein, but for occasional use, the HF has been great to have around. I’ve thought about picking one of these up. You can usually find them in the coupon page in mags like PopSci and PopMech. I would think that for the average weekend warrior do it yourselfer, the Dremel would be a sweet spot in price and functionality. Myself as a poor college student would use the HF special. I did the same with a regular Dremel since I didn’t want to pay the extra $60 just to get variable speed. Once I needed it though, I hacked together a controller to give me a bit extra functionality. You’ve got to be kidding. The HF base version is often on sale for $35 and it works AWESOME. I’ve extensively used it. Additionally, the HF variable speed model is even better and does absolutely everything but best of all, the attachments lock in better to this model. More important than all of this is that the HF attachments are a third or less the price of pretty much any other brand. I will chime in here too. There are many coupons floating around where you can get it for under $30. It has been a very popular tool already, and mostly very good reviews. Only negatives i can recall is that a wire on the brushes can come loose, or something like that. easily fixed. I do own the fein top kit, and have used the dremel version quite a bit too. The dremel is a POS in my opinion. small, underpowered, shakes like crazy. If I was looking for a cheap one, i would go with the HF. If I was looking for something better, I would make the jump from the $110 of the dremel, and just spend the $190 of the fein (it is $400 for the top kit with all attachments) The fein really is day and night better than the cheaper ones. But probably not worth it for the weekenders. There are many places you can get aftermarket blades for Fein now, most are as good, if not better, and cost under $15. I usually use multiblades.com for mine, but there are others. I just bought a Bosch cordless model at Lowes and used it to undercut door trim for a laminate floor – worked great. Had I known about the HF model, I might have considered it. I did read some online reviews of the Dremel but motor burnout seemed to be a recurring theme. I have the HF model and have used it a little bit. My favorite thing to use it for lately is cutting perfect holes in sheetrock. Sure you could use a holesaw, but with the mutlitool you can very easily cut a perfect square and it doesnt mar the paper on the front side at all either. Also used it to cut through the back of a cabinet & sheetrock to add an outlet for a microwave. Worked flawless and I didnt have to switch tools. My only regret is I got the base HF model before they came out with the variable speed one. I have the sears one (I won it from following them on twitter) and while it doesn’t have variable speed, it has a vacuum port. Awesome for when my drywall mud joints get a little tall. Haven’t tried it in scraping applications yet but I like the vac port better than I would like the variable speed. Oh and it’s cordless. Just picked up the Variable speed version at HF for $49.99 today. I bought the variable speed model from HF recently to remove to some old and extremely tenacious linoleum in a kitchen and a bathroom of a rental unit. I had to sharpen the scraping blade about ten times during the project, but it took an eight hour job down to a four hour job. The tool is not as well balanced as the Fein, and the blades are utter crap, but the price was great for the work it did. This was the first non-pneumatic tool I bought from HF so I was a bit skeptical, thank goodness I gave it a shot. Also, I see that quite a few companies are making aftermarket blades for the HF tool, and I hope they are of better quality than the pot metal it comes with. I’ve had the Fein MM start for a few years now and it’s worked like a champ for everything: sanding, sawing, scraping, etc. The “start” model does not have the quick release mechanism, but its only like $200. For that extra $$ you’ll get a tool that lasts 30+ years instead of 6 months. The Fein blades are expensive–so don’t buy ’em! Get 3rd party blades off the web, i.e. multiblades.com or make ’em yourself from cheap Home Depo hand saws, or modify HF blades to work with Fein’s star mount–use a dremel cut-off wheel to cross-slot the circular hole. BTW, the Bosch blades are just about as expensive as the Fein, so Fein is not the only overpriced system out there. The $400 figure that’s thrown around for the Multimaster is for the top-of-the-line kit that comes with a bunch of attachments and a plastic case. Why not save the cash, buy only the attachments you need and pick up a generic real metal case from a place like ACE Tool or Coastal Tool? That’s what I did. I replace and install new doors and windows as my trade of choice. I bought the newer MM from Fein, and I would never buy any other oscillating tool from another company. Many of the contractors I know who work in this trade saw that I had the “orange tool” and said I over paid. A few bought a cordless version and one bought the Dremel version. Fast forward to a few months and they were mostly complaining about power and craftsmanship. One of my older friends bought a MM ( true tradesman) after the Dremel, and he just didn’t think he would use the tool that often, so he bought the Dremel. He uses the MM as much as I do, and it is the perfect tool for what we do. I used this tool to drop a R/O inside the wall without disturbing the interior and exterior until I was ready. It has a decent vacuum attachment that helps with dust as well. I buy my blades in bulk to keep the costs down. It’s so easy to deglaze an IG unit with this tool, that I can’t remember what I did before it. This HF tool would be perfect for the homeowner’s garage. Many uses. I purchased the Dremel from CPO Outlet and I was really happily surprised and happy about how fast and accurately it worked. I was going to get the HF one but came accross the CPO for 69 bucks. The HF should work just as well. I bought one of the single speed H. F. oscillating tools a few months ago. If you look around you can get a 20% off coupon in the newspaper or a magazine, that’s what I did. I used it to cut off door molding at the base so I could slide tile under for a nice fit. I also use it to flush cut a few other things, wood stuff so far. It worked well on all occasions. I will not use the tool very often so H. F. seemed like a reasonable cost effective purchase. In a nut shell: useful and so far-so good. I knew better, but I tried the Harbor Freight route. Save you’re money!! The saying “you get what you pay for” still rings true!!! I have the Harbor Freight version, hitch had the option of being cordless. I bought the cordless version, but I don’t think it would make a difference in its function. The sander is pretty much useless. I feel like I used less energy and time sanding by hand. It works on unfinished wood, but if you’re trying to sand lacquer, just get a hand held belt sander or sandpaper. Bought the H.B. version to try. A friend a serious if cheap do-it- yourself er borrowed it. Brought back very quick; went down & bought his own. Said it was even better than a back saw for cutting modeling when putting in new flooring. I Liked it enough to add the Ryobi version to add to my 18 volt. The variable speed does make a difference.